Emergencies can happen in the blink of an eye. When they do happen, you need an emergency room nearby. For over 85 years, Yoakum Community Hospital has been providing emergency room services in Yoakum, Texas. In 1996, we were the first hospital in the area to receive a designation as a Level 4 Trauma Facility by the Texas Department of Health. This means we have met their standard of care for treating emergencies and our staff has specialized training in cardiac, pediatric, and trauma emergencies. 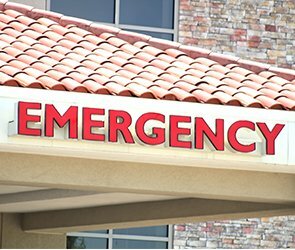 Our emergency department is staffed 24-hours-a-day with highly qualified physicians and nurses who are dedicated to providing the best emergency care available in the area. So don’t think twice when an emergency happens. We’re ready for you around-the-clock, seven-days-a-week.